It’s been raining cats and dogs lately in Colorado’s high country. Now it’s raining trout.Three hundred twenty-five thousand trout, to be exact. 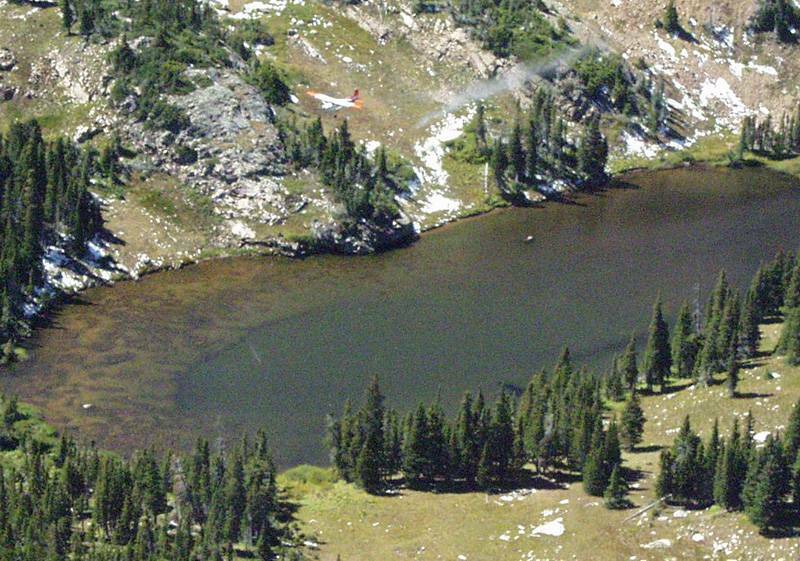 The Colorado Division of Wildlife began using aircraft to stock high-mountain lakes throughout the state with fingerling trout Monday. Modified Cessna 185 aircraft are undertaking difficult maneuvers to skim within 125 feet of the lakes’ surfaces and drop their cutthroat cargo. The aerial stocking operation will continue through mid-September and include a handful of lakes in the Roaring Fork Valley basin. If you’re hiking to American Lake, Anderson Lake or Avalanche Lake and see a plane dumping something into the water, don’t freak out and call Homeland Security.Don’t laugh. It happened: In 2002, when the nation remained on high alert after the 9/11 terrorist attacks, an aircraft with extra trout dumped its load on Ruedi Reservoir. The water that exited the plane with the trout appeared to people on the shore to be a white powdery substance. Their report to authorities touched off an investigation. State wildlife officials had to sell the fish story to the FBI and Secret Service.The aircraft stocking the lakes are white with orange or red markings and have a painted DOW seal. Not many lakes in the Roaring Fork basin or the region are on this year’s stocking list. The wildlife division alternates the years that it stocks different regions. Usually the region that includes the Aspen area is stocked in even years, but there are always exceptions, said Sherman Hebein, senior aquatic biologist for the Northwest Region. Anderson Lake, in the Lincoln Creek drainage east of Aspen, is scheduled to be stocked with 860 cutthroat trout between 1 and 2 inches long. American Lake, in the Castle Creek drainage, will be bombed with 280 cutthroats. Avalanche Lake, in the Crystal River drainage, will be on the winning end of 850 cutthroats.The operation this year also will stock other Northwest Region lakes in Garfield, Eagle, Summit, Grand and Route counties. All told, 50,800 fingerlings will rain from the sky in the region. The division will stock 284 lakes statewide. All the fish will come from the DOW hatchery in Rifle, where testing confirmed they are free from whirling disease. The Colorado River, greenback and Rio Grande strains of cutthroat will be stocked.Hebein said stocking is necessary to maintain fish populations because many trout die during winters in the high mountain lakes. It doesn’t happen every year, but it happens often enough to eventually wipe out the fish. Many of the lakes are in high mountain bowls where space is tight and wind currents are unpredictable. To stock the fish successfully, the plane has to be within 125 feet of the surface in order for the fish not to dry out before they hit the water, according to the wildlife division. The typical speed of the aircraft at the time of the drop is approximately 85 mph.